Posted in Advice from Spiritual Friends, FPMT News Around the World, Mandala. 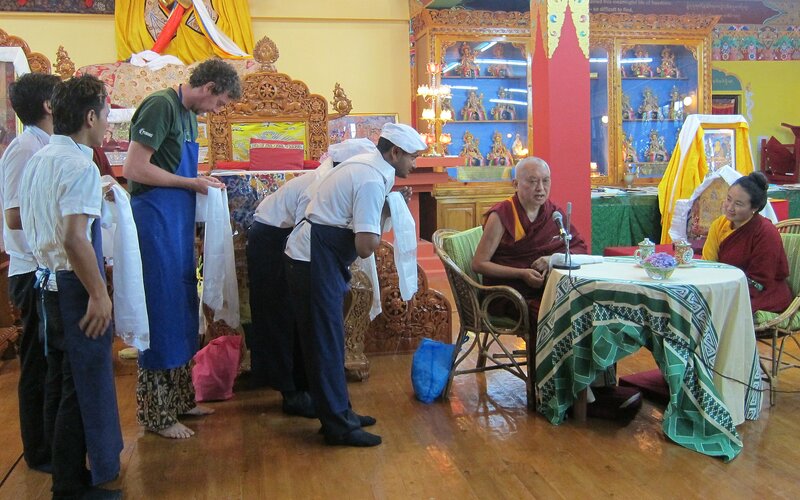 Lama Zopa Rinpoche giving advice to the cooks of Tushita Meditation Centre, Dharamsala, India, June 2013. Photo by Ven. Sarah Thresher. I have been hearing from people that the food at Tushita is fantastic. Generally, they tell me they are very happy with the place and especially the food. I was amazed to hear this and particularly that you have been able to improve the flavor and quality of the food without using onions, garlic or other black foods. Of course, the initial reason why people come to Tushita is not the food, but for the teachings and meditations; they are a little bored with the lives they have and are looking for something new. However, the conditions at Tushita –and especially the food – are a very important support for the teachings and meditations. Sometimes in the past, for example, when I would teach on impermanence, the hells and the eight worldly dharmas, people would get scared and leave, but if the food was good, they would stay. That’s one way to keep them! So I’ve been thinking for many days to come to the kitchen and explain a short meditation to the cooks. There is a short morning motivation I have put together with a direct meditation on the graduated path to the peerless happiness of full enlightenment. (Most of the time in English we use the expression “fully enlightened” but in Tibetan it is sang gye; sang means that all the obscurations, gross and subtle have been purified, and gye that all the realizations have been fully developed and there is nothing more to achieve. “Fully enlightened” has a different meaning; it’s better to say “fully omniscient mind.”) [This meditation is] followed by some verses explaining how precious and kind sentient beings are. Lama Zopa Rinpoche with one of the Tushita cooks, June 2013. Photo by Ven. Sarah Thresher. Every single sentient being is most precious, dear and wishfulfilling – fulfilling all your wishes for the happiness of future lives, liberation and enlightenment. Every hell being, hungry ghost, animal, insect, ant, mosquito, bird, goat, human being, sura and asura does this. That is because all our beginningless past lives’ happiness, present happiness and future happiness comes from good karma and that good karma comes from your mind, from mental intention. Buddha’s enlightened activity is of two types: one comes from Buddha’s holy mind and one from your mind. Buddhas come from bodhisattvas, bodhisattvas come from bodhichitta and bodhichitta comes from great compassion. Great compassion comes from every single obscured suffering sentient being. There is no way to generate great compassion without depending on every single suffering sentient being. Therefore, there is no bodhichitta, no bodhisattva, no Buddha and no way to create good karma, the cause of happiness, without them. In other words, every single happiness and comfort comes from sentient beings, even a cool breeze or a drink of water when you are thirsty. Without sentient beings there is no way to experience happiness in this life, future lives, liberation or enlightenment. All our happiness comes from every single sentient being. For example, all my happiness comes from every one of you and from all the rest of the sentient beings; every hell being, hungry ghost, animal, human, sura and asura. All my past, present and future happiness comes from everyone because Buddha, Dharma and Sangha in whom I take refuge and with whom I purify every single negative karma and achieve the peerless happiness of full enlightenment come from everyone. That is why sentient beings are most kind, dear, precious and wishfulfilling. Sentient beings are more precious than a wishfulfilling jewel because you can’t practice morality, purify negative karma and achieve a higher rebirth with a wishfulfilling jewel. Nor can you practice the three higher trainings and achieve the ultimate happiness of liberation or generate great compassion and achieve enlightenment with a wishgranting jewel, but you can with sentient beings. If you pray to a wishgranting jewel you can get a house, car, swimming pool and so on, but not higher rebirths, liberation and enlightenment. That’s why sentient beings are most unbelievably precious. Which one is more precious – skies of wishgranting jewels or sentient beings? Sentient beings are more precious! Therefore, dedicating your life to others and helping them is the best, most exciting thing you can do. Serving them in any way you can and giving them whatever help you can give is what brings the most happiness. For example, helping an old man carrying a very heavy load or giving your seat to somebody in a bus, train or car. Doing whatever it is that sentient beings need, whether big or small, is the most satisfying, exciting thing you can do. That’s why making delicious food and offering it to the people who come here is a really great opportunity. Wow, wow, wow, wow. It is a way of offering comfort and happiness to sentient beings who are most wishfulfilling. That’s what brings the most happiness and excitement. It’s the real Dharma. Dharma is something that protects your life, protects you from suffering and guides you to happiness…. There is a great deal to rejoice in that you have this very precious opportunity to offer food to sentient beings who are most precious, dear, kind and wishfulfilling. Lama Zopa Rinpoche and Khadro-la with Tushita Meditation Centre cooks, June 2013. Photo by Ven. Sarah Thresher. I am cutting the root of all sentient beings’ suffering which comes from ignorance and the self-cherishing thought, with the knife of the wisdom realizing emptiness (shunyata) and bodhichitta. I am washing away all the obscurations and negative karmas from all sentient beings’ minds. You can think that you are washing away your own obscurations and negative karmas but most important is to think you are washing away those of all sentient beings. And you can think the water is nectar coming from Vajrasattva, the Guru, His Holiness the Dalai Lama, or Guru Shakyamuni Buddha. There is always a lot of washing up to do in the kitchen and you can use the opportunity to purify all sentient beings’ obscurations. It’s very good if you can sincerely think this way because all the washing up becomes Dharma practice purifying your negative karma and defilements and collecting merits. In India even the beggars keep their pots very clean! When you are sweeping the floor think that the broom is the whole path to enlightenment, especially wisdom and bodhichitta, and that the dust is all sentient beings’ obscurations. I am sweeping away the dust of all sentient beings’ obscurations with the broom of the path to enlightenment and especially wisdom and bodhichitta. If you sincerely think this while you are cleaning it becomes real Dharma practice that benefits all sentient beings. In the lam-rim it says to think that you are abandoning the dust of the three poisonous minds – anger, attachment and ignorance – which are the gross obscurations and also the stains of the three poisonous minds, the subtle obscurations. I am taming all sentient beings’ minds by softening them with my two hands of the wisdom realizing emptiness and bodhichitta. I am filling all sentient beings’ minds with the realizations of the path from guru devotion up to enlightenment so that they can actualize all the qualities of a buddha. When you are cooking soup or other food you can think that the fire is the Six Yogas’ tummo fire that causes the kundalini to melt. Do the same meditation that is used to bless the inner offering in highest yoga tantra. Or you can think that the fire is the wisdom realizing emptiness and the uncooked food is the unsubdued mind. By cooking the food all the gross and even the subtle delusions are purified and all the realizations of Buddha are achieved. These are some ways of thinking as you are working in the kitchen. You can think in a similar way with other kitchen activities. Typed and edited by Ven. Sarah Thresher at Tushita Meditation Centre, Dharamsala, India, June 17, 2013. Mandala brings you news of FPMT activities, teachers and events from over 160 FPMT centers, projects and services around the globe. If you have news you would like to share, please let us know.